A typical movie night out consists of either gulping down food at a restaurant while constantly checking your watch before rushing off to the movie, or purchasing mediocre, overpriced hotdogs, nachos, popcorn and soda at the theater. Either situation leaves you totally un-relaxed, and in need of another night out. But please don’t start the cycle all over again. Instead, try Brewvies Cinema Pub, where you can enjoy a good movie and great food simultaneously. No, this is not a place where they see you coming and throw food in the microwave or place it on a warmer; this food is all housemade and delicious. There are some wonderful burgers, pizzas and sandwiches, but I would highly recommend making a meal out of the Teasers (appetizers) menu. 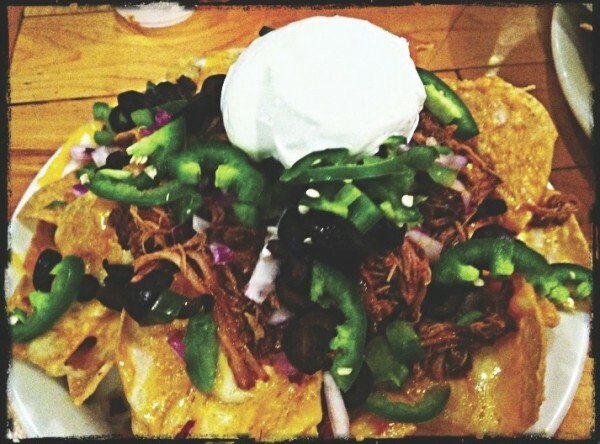 Start with the slow-roasted pork nachos. The pork is roasted overnight to an ideal taste and tenderness, then placed over fresh-cooked tortilla chips and served with veggies, sour cream, fresh sliced jalapeño peppers and housemade pico de gallo. These nachos are borderline addictive. Move on to the veggie chili for course No. 2. I know what you’re thinking: What’s the point of chili without meat? I had the same thought, and was delightfully surprised by the smooth sauce and flavor-packed vegetables. I also assume that the main reason for excluding meat was to make room for the extra peppers and spices. This chili packs a powerful (but not overpowering) punch. I had eaten only half the nachos and chili, but still wanted to try the Texas taters—hand-cut fries smothered with cheese and topped with bacon. I ended up being too stuffed for the taters, black-bean eggrolls or the pizza bread. We are used to planning food around a movie, but at Brewvies, we get to plan a movie around food. The way it should be.